In the year of 1929, God fulfilled one of his many promises according to His eternal Word: “The Lord is not slack concerning his promise”, as some men count slackness; but is long suffering to us-ward, not willing that any should perish, but that all should come to repentance. During that year, Sister Helen Myles, after being converted by the Gospel of Jesus Christ herself, asked her brother (then Elder James P. Simms) to come to Central Avenue and preach unto the people the Word of God. The condition of the lives of men and women in the area was sad, in that they were laden with sin. Elder Simms, who was then preaching in Baltimore, Maryland, responded to the call and along with his wife, Sister Evelyn Simms, came to Central Avenue. Others accompanied him on this mission: his mother, Mother Helen Simms, two of his sisters, Sister Helen Myles and Sister Marion Hill, and two women, Sister Black and Sister Annie Mitchell. A tent was erected and Elder James P. Simms took items from his own home (rugs, chairs, a table, and the family piano) to provide a place to worship the Lord Jesus Christ. From this lowly beginning, the Lord added to the Church, such as should be saved. The power of the Holy Ghost was witnessed in the midst of the people; bodies were healed, broken families mended, and souls delivered from the powers of darkness! That first summer ended, and cold weather moved in. What was to become of this small tent worship? “The Lord will provide!” God moved on the heart of the late Brother Frank Myles, who was then a Catholic and not a member of this church, to offer his log cabin for services. Rejoicing and praising God, the members and onlookers traveled off the main road to their new church home, and the praises of God continued to ring out through the woods. When warm weather returned, they moved back to the main road and services were resumed in the tent. As worship services continued, plans were made to purchase land to build. Mr. Ridgley, then owner of the land, offered to sell the Church some property on which to build. When asked a price, they were told a down payment of $500 was needed. In that day, this was a great sum of money. It was then, however, that the late Mother Virgie Myles spoke up and said, … “We Can Do It! ” Everyone joined in and put their shoulders to the wheel and went to work to raise money for the down payment. They made and paid pledges, picked and sold blackberries, baked and sold cakes and pies, and through the help of the Lord, when it was time to make the payment, … They Had the Money. PRAISE GOD!!! The Church continued to work, and plans were made to build this present edifice. The schoolhouse was purchased, and for several years, services were held there during the winter, and in the tabernacle during the summer. Later, the schoolhouse was moved back so the construction could begin in this spot. It was a long and hard struggle, but…”the people had a mind to work, so built they the walls.” There was one point when no work was done on the edifice for quite a long span. Realizing the work of the Lord must continue, Elder Simms resigned his job at the Post Office to give full time to the work of the ministry. God, pleased with their great determination, upheld the hands of His man-servant, and strengthened the hearts of His people. As the brothers worked faithfully on the building, the sisters stood by their sides, pulling nails from used lumber, preparing meals, and doing what ever their hands found to do. Through this great, united effort, this edifice was dedicated in 1939. PRAISE GOD FOR THE VICTORY!!! As the people worked to build a place of worship, the unadulterated Word of God continued to be preached by Elder Simms. Multitudes heard the Word, were convicted by its powerful message, and gave their lives to Christ. Anointed and directed by the Holy Ghost, Elder Simms began to take the gospel message to other areas: Cedar Heights, Maryland, Brandywine, Maryland, Malcolm, Maryland, Charles Town, West Virginia — all of which have rich histories of their own, and examples of powerful men and women who gave themselves as instruments of righteousness to be used of God. The Lord continued to bless the efforts of the people and under the able leadership of Bishop James P. Simms, a radio broadcast was established. As the powerful message of salvation, through Jesus Christ, rang out over the airways, more souls heard the Word, accepted its truth, and were delivered from the power of Satan. In 1971, Bishop Simms was led of the Lord to ordain Elder Walter A. Newman of Charles Town, West Virginia, Vice Bishop of the House of Prayer Church of God, Inc. “My soul longeth, yea even fainteth for the courts of the Lord: my heart and my flesh crieth out for the Living God…” This was the theme of the last revival service conducted by Bishop James P. Simms in February of 1974. In May of 1974, the Lord called His servant home. Vice Bishop Walter A. Newman then became the Bishop and General Overseer of the House of Prayer Church of God, Inc.
“Moses my servant is dead; now therefore arise, go over this Jordan, thou and all this people, unto the land which I give to them, even to the children of Israel”. As God raised up Joshua in the midst of the people, so did He give us a young man of Faith and Power. 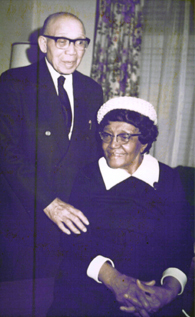 In May of 1974, Elder Francis S. Myles, Sr., became pastor of the House of Prayer Church of God, No.1. Under his leadership, God has continued to bless the Church, and has proven true to His word, “…I will never leave you nor forsake you… Lo, I will be with you always, even unto the ends of the earth”. On July 27, 1985, our Pastor was ordained Vice Bishop of the House of Prayer Church of God, Inc. Bishop Myles is a dynamic and anointed “Minister of the Gospel”, who preaches the unadulterated Word of God in great power, knowledge, and understanding. Under his leadership, the Church continues to move forward, spiritually and naturally. Spiritually, souls are continually being added to the Church, such as should be saved. Naturally, God’s house and its ground have been expanded and there is an ongoing beautification program. On January 9, 1999, in favor with God and the Church, Bishop Francis S. Myles, Sr. officially assumed the awesome responsibility of Presiding Prelate and General Overseer of the House of Prayer Church of God, Inc.